…the F9000 is a television built for the future; and well ahead of its arrival. Samsung F9000 Series information: This review is based on our hands-on experience with the 65-inch UN65F9000 TV. However, our observations also apply to the 55-inch UN55F9000. 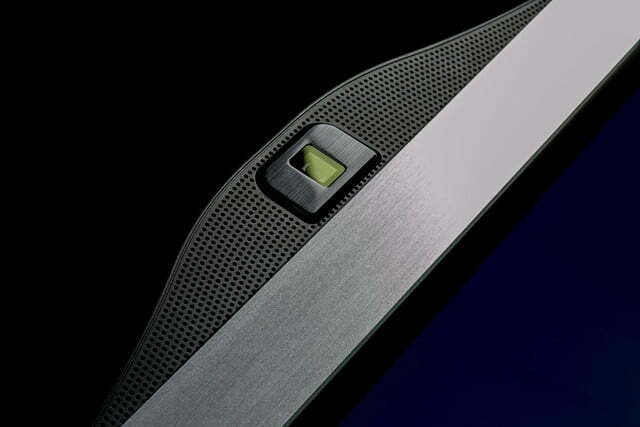 According to Samsung, the two sets differ only in dimension and weight and offer identical features and performance. A funny thing tends to happen this time of year: In preparation for the holidays, you start making your big purchases, perhaps even splurging on that next-gen tech you’ve been eye-balling for the past few months. Then, no sooner have the holiday decorations been taken down when the largest consumer electronics show (CES) in the nation comes along, and with it, sudden obsolescence of the sweet new stuff you just bought. Frustrating, isn’t it? 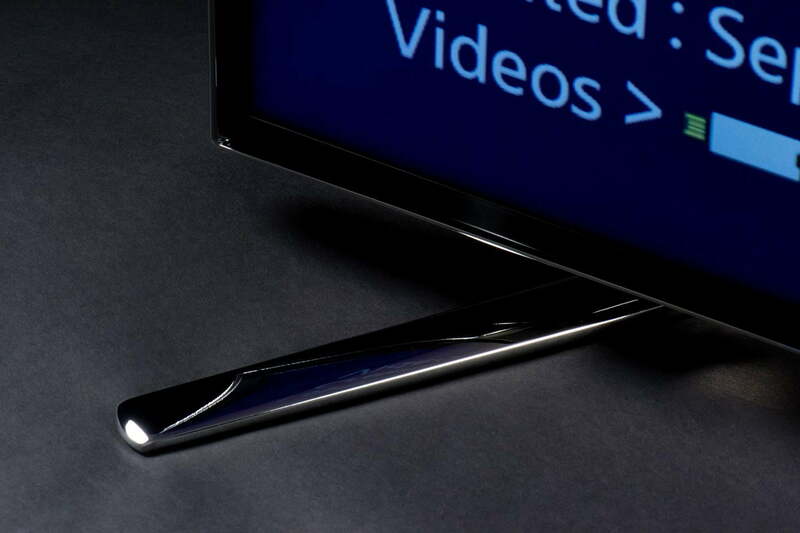 There’s just something to Samsung’s televisions that feels appealing. Well here’s some encouraging news: That sentiment doesn’t apply to all electronics (the PS4 and Xbox One being two prime examples). So, if you’ve been considering an Ultra HD 4K TV as a holiday purchase, know that it will not suddenly be old hat come January. At the very worst, you’ll have spent a lot more money than the next guy getting the next newest thing. If you’re OK with that, then the Samsung UN65F9000 series should be on your short list, right next to the LG LA9700 series. 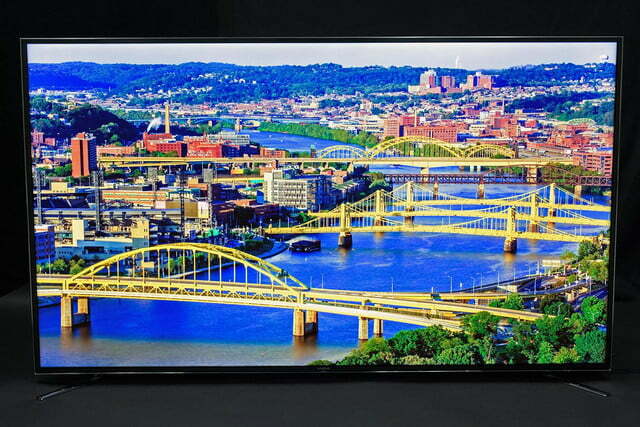 Both are expensive, ahead-of-their-time Ultra HD LED television sets, each with their own distinctive attributes. In this review, we take a look at Samsung’s 4K flavor, and consider how it differs from the more monstrous 85-inch S9 we recently reviewed. We’re not sure why we expected the F9000 to look exactly like Samsung’s top-tier F8000 1080p TV series, but we did. Thing is, it doesn’t. While the F8000 has a nearly imperceptible bezel and zero border, the F9000 has a very slightly larger bezel and a noticeable border. And while that may sound like a step backwards somehow, we certainly didn’t feel so. In fact, in some ways, we prefer the look of this television over the F8000 series (which we lauded as the best design of the year). 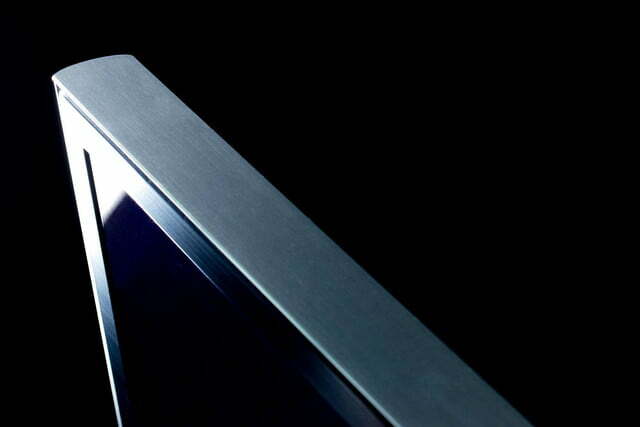 The woo of the bezel-less and border-less LED television has begun to wear off, and we think designs like the F9000’s – with just a little more meat at the edges – might start to catch on. The F9000’s stand, on the other hand, is exactly like the F8000’s. It looks cool and keeps the TV slung low and stable, but it’s wider than the TV, and we think that could present a problem in certain placement situations. 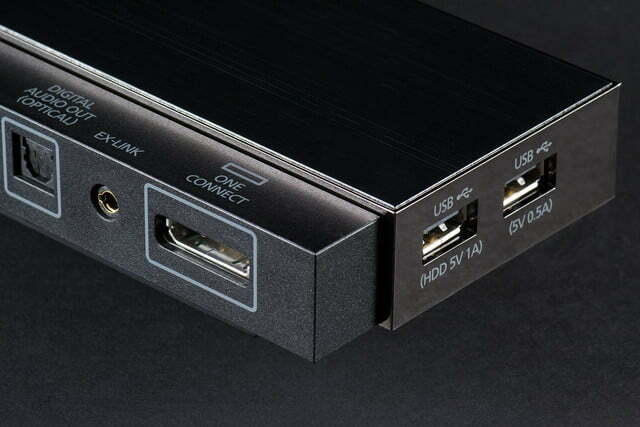 The F9000 comes with Samsung’s One Connect box, which moves all of the TV’s inputs and outputs to a separate box that connects to the TV via a single, proprietary cable. We’re big fans of this approach because it makes connecting and disconnecting components easier, allows for a single cable to be run to the TV without requiring an A/V receiver, and because it can be swapped out, effectively upgrading the TV. 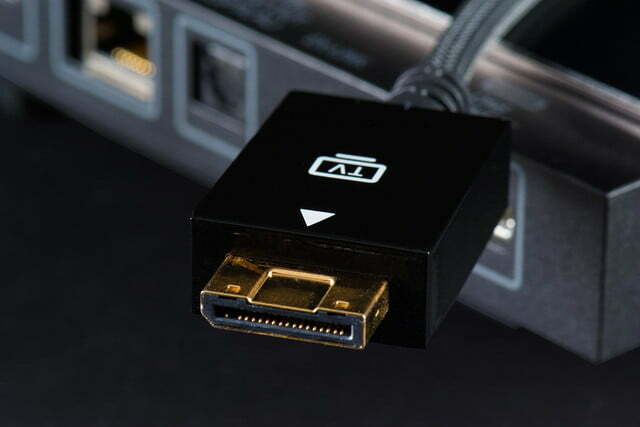 When HDMI 2.0 starts rolling out, Samsung will likely instate a One Connect box swap-out program, effectively updating the F9000 to the latest HDMI standard and Smart TV interface. 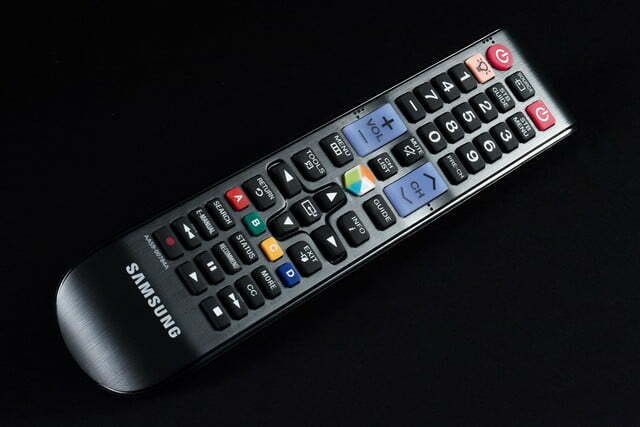 We were also pleased to discover that Samsung includes two different styles of remote control with the F9000. You get both the company’s Bluetooth trackpad-style Smart Touch remote, and a much more familiar black wand adorned with a multitude of handy buttons. Batteries for both remotes were included. In a separate accessories box we found four active 3D glasses, an IR extender cable, a power cable and a user manual. When comparing the F9000 to the competing LG LA9700, it’s hard not to notice the price difference right away. Presently, about $1,500 separate the two models, with the LG LA9700 running about $6,500 and the Samsung selling for about $5,000. Why the steep difference? 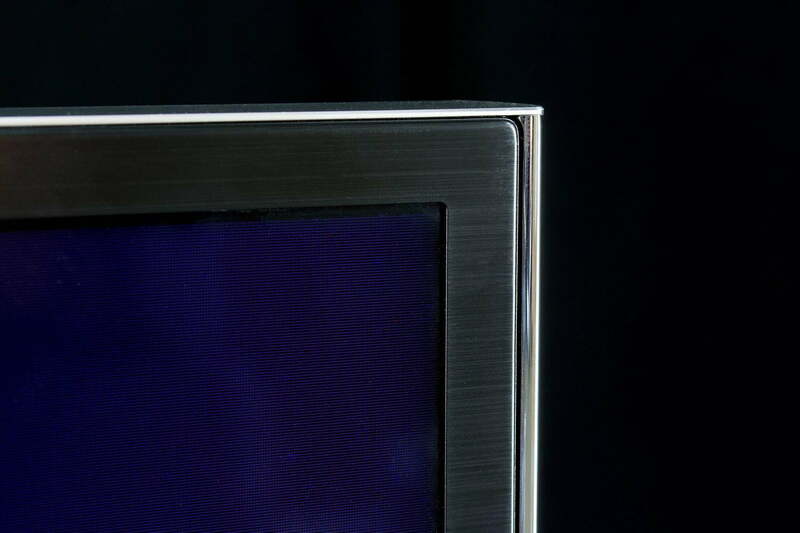 The woo of the bezel less and border less LED television has begun to wear off, and we think designs like the F9000’s … might start to catch on. We’re betting it has something to do with the fact that LG LA9700 has a full array of locally dimmed LED backlights, while the Samsung F9000 only has locally dimmed edge lights. 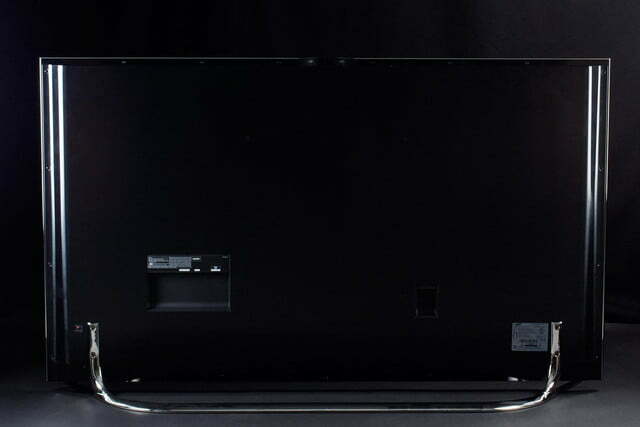 With a full array of backlights, the LA9700 has a potential advantage in the areas of screen uniformity and black levels. Aside from that, the TVs look very similar on paper, and that led us to wonder if the advanced LG backlighting could be worth the $1,500. We would soon find out. 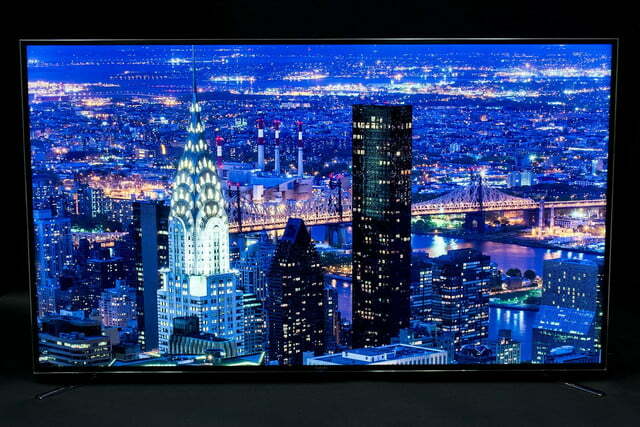 The F9000 is a 4K TV, yes, and now Samsung is including some 4K content with the purchase of its 4K TVs. But we all know that until Netflix is streaming 4K movies and TV shows and we (possibly) see 4K Blu-ray come around (we’re eye-ballin’ you, Sony!) then most of what will be watched on this TV is 720p or 1080p content. That being the case, the F9000 employs an upscaling chip which will take a source with a resolution lower than 3,840 x 2,160 and and scale it up for use with the TV’s higher pixel density. In order to not look like garbage, the scaler must do a really good job. But upscaling is often oversold as a magic pill that makes low resolution sources look better than their native resolution should allow. This is something we were going to keep our eyes on during our evaluation. Naturally, the F9000 comes packing Samsung full arsenal of everything. 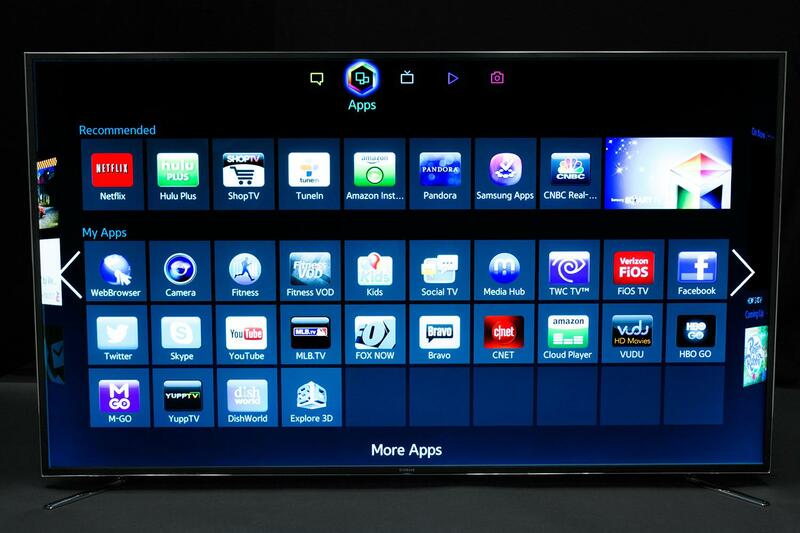 Pop-up camera, gesture control, voice recognition, a quad-core processor for speedy operation and Web navigation, a fully-featured Web browser, more video-on-demand (VoD) apps than you could ever hope to use, built-in Wi-Fi, Samsung’s All-Share media ecosystem, and S-Recommendation software which suggests what to watch on your cable or satellite service based on your viewing habits. For ISF-calibrators, all the adjustments necessary are present. For more information on Samsung’s Smart TV features, you can read the features section of our Samsung F8000 review here. Need a lot of inputs? 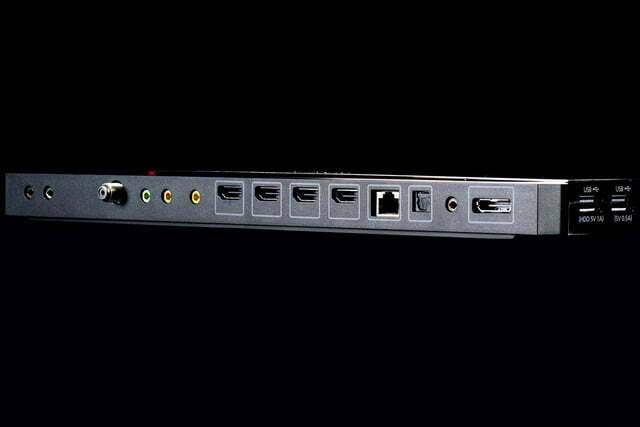 Samsung’s One Connect box has plenty of them: 4 HDMI, 3 USB (one of which is on the TV itself), Ethernet, 1 component, 2 composite (shared with component), RF for terrestrial/cable, audio in and out mini jacks, Digital Optical output, IR out for included IR repeater, and an RS232 port. 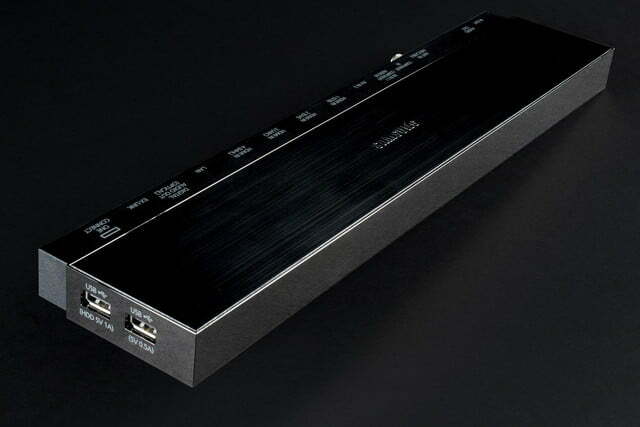 Finally, we were pleased to note that the F9000 uses DTS processing for its two-channel speaker output. It will also pass through a full DTS surround sound audio stream via the TV’s digital optical cable (if the streaming content of off-air broadcast includes the stream, it will not pass DTS signals delivered via HDMI through the optical port). 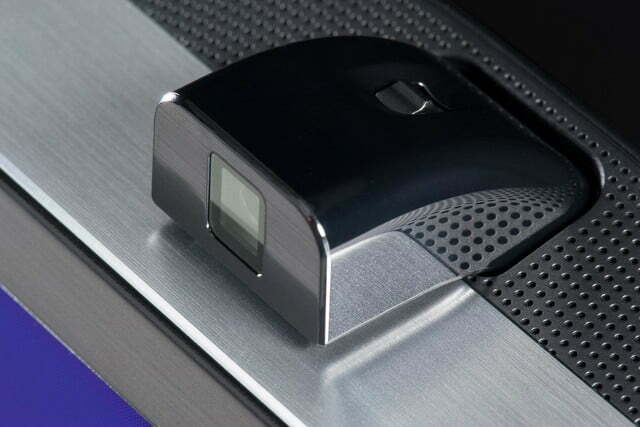 For this review, Samsung included a USB drive with some 4K test patterns and some 4K landscape and cityscape scenes. All other material was delivered by an Oppo BDP-103 Blu-ray player set to output at either 1080p or 4K, depending on the nature of our evaluation. We also viewed content via a Comcast HD set-top box, a Roku 2 XS and the Amazon, Netflix and VUDU apps built into the TV. We were not able to view any media from our media server because, once again, the TV couldn’t seem to play nice with our Plex media server. The F9000 produces a gorgeous picture. Whether we were watching 720p, 1080p or 4K content, it all looked excellent under passive observation. Shoot, even standard-definition cable channels were tolerable, if only because the F9000’s video processing was forgiving. Videophiles with more experience than the average Joe at examining picture quality would likely notice that, as good as the F9000 is, it still can’t match the performance of today’s best plasmas. But it does get quite close. We especially enjoyed the F9000’s vibrant and vivid color output. 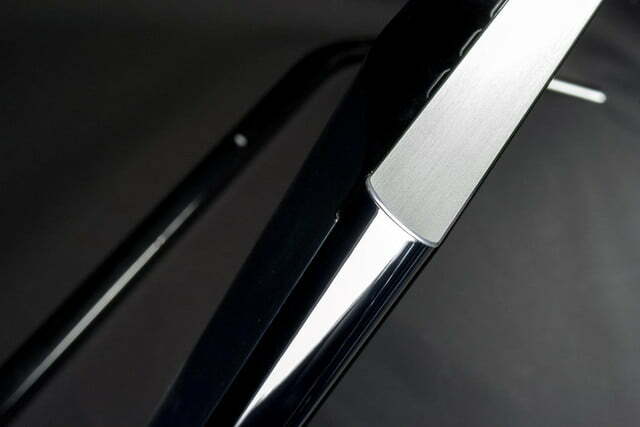 The screen’s anti-glare coating was especially effective, and on more than one occasion we appreciated that the set’s excellent off-axis response. Whether we were watching 720p, 1080p or 4K content, it all looked excellent under passive observation. Screen uniformity and black levels matched up with what we expected – both above average – however, LG’s LA9700 performed very slightly better thanks to its full array of locally-dimmed backlights. Was it $1,500 better? That will be up to the viewer – we really like our superior blacks. But it was an appreciable difference and, let’s face it, when you’re spending this much for a TV, $1,500 more for marginally better performance is going to be worth it to some folks. To be sure, the F9000 doesn’t offer quite the same experience as the $40,000 S9 we recently reviewed. If we were to take off our videophile club membership badge for a moment, we’d have to say that there’s just something to Samsung’s televisions that feels appealing. In the same way that Sony and Toshiba’s TVs have a certain look to them (for better or worse), Samsung’s do too. Of course, you can work the F9000 into submission with heavy calibration and get it to comply to a standard if you want (and more power to you) but if you’re like most folks, you’re going to grab one of the TV’s presets and never look back. For the latter group, Samsung’s presets dazzle. We could easily take the movie mode, strip it of its motion smoothing (noted in our settings section) and live perfectly happy for years. For all the griping we do about high-end TVs having low-end sound, you might expect the F9000’s sound quality would be terrible. Thankfully, Samsung stepped up the audio output for this TV, and it isn’t half bad. A dedicated woofer offered sufficient bass, and a row of down-firing speakers still managed to sound intelligible for dialog. We think the LG LA9700 offered a beefier sound with a touch more clarity, and its motorized speaker system is just kind of cool. With that said, if you don’t care to see your speakers, even if they are motorized, the F9000 will make you happy. We still heartily recommend a supplemental sound system, though. Don’t shortchange your cinematic experience with on-board audio! There’s something that bugs us about almost every television we test and the F9000 is no exception. This time, it was the promise of a more enjoyable remote control experience, thwarted by a finicky IR reception. 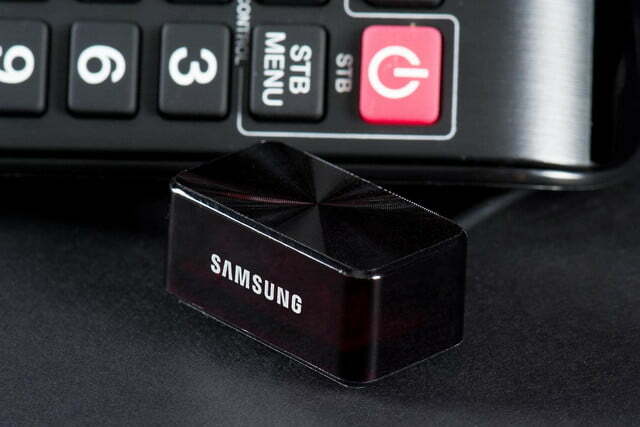 We were happy to see Samsung include a traditional remote, but the problem was that unless we had the remote pointed at just the right angle and just the right level, it didn’t want to play nicely with the TV’s IR sensor. In fact, it was so frustrating at times that we almost went back to the Smart Touch remote, which we’re not terribly huge fans of. Also, we don’t need a graphic reminding us that the camera is turned off every time we turn on the TV, and we’re guessing most folks don’t either. If there is a place to disable this pop-up in the settings, we didn’t find it in time. We’d love it if it was never there at all. On the plus side, at least it isn’t a default pop-up advertisement (we’re looking at you, Panasonic). 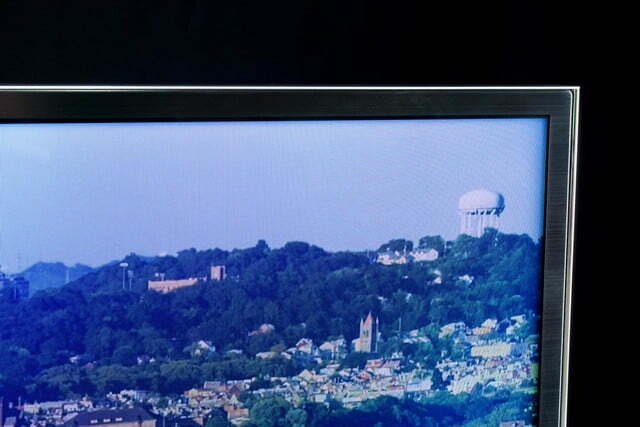 Samsung’s F9000 is an outstanding television. Then again, so is the F8000, which happens to cost about $1,700 less online. The big differences are the ability to take advantage of 4K material when it comes available and an easy upgrade path via Samsung’s One Connect box. 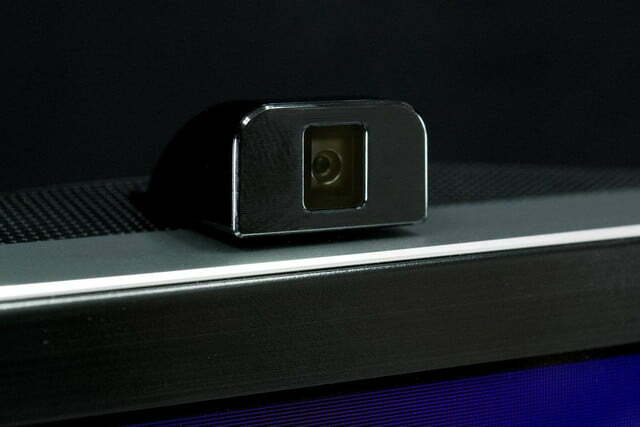 Indeed, the F9000 is a television built for the future; and well ahead of its arrival. 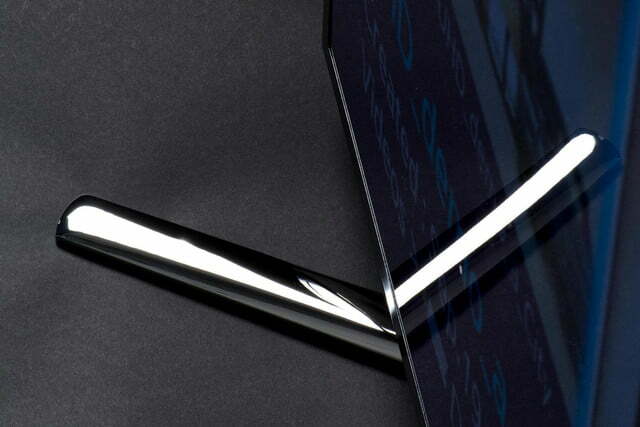 The question is, is that slice of the future worth $1,700 to you? Let us know in the comment section below, and we’ll see ya on the other side of the 4K rainbow.